With only a couple weeks left in the semester, the coffee consumption of the average Regent student is about to spike – big time. Thankfully, Café Moka has released two holiday additions to their menu. As usual, the Daily Runner editorial staff sat down and had a “business meeting” to try these selections. This winter classic is actually available all year-round, a favorite of our Culture department head, Andrew. 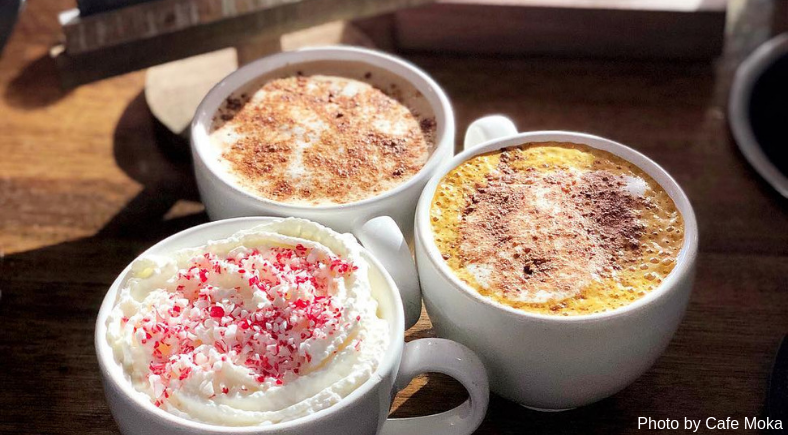 The only difference detectable by human senses between the normal menu item and the holiday special are the cute peppermint sprinkles that top the whipped cream. And that’s enough for us! If you found this drink under your Christmas tree, it would be the matching PJs your grandma bought all the grandkids from your childhood. Warm, familiar, and oh-so festive! A completely new drink, though reminiscent of the tea lattés, the Gingerbread Latté is the perfect balance of sweetness and spice. This drink was a universal hit, beloved by the whole staff and the guests that popped by the table (yes, we all sipped from one cup; pray for our health). Even if you’re not a gingerbread fan – like department head Renée – you’ll still love this drink. It will tempt you with thoughts of the holiday season, while energizing you to finish those finals. It’s the ultimate comfort-food drink! If this were a present, it would be the “our 1st Christmas” ornament my grandma gave her new husband last year – novel and full of promise, aggressively festive, and maybe too sweet but endearing nonetheless. Get this drink as a delightful pick-me-up before your afternoon class. That’s all we have for you this time. Consider this your “Merry Christmas” postcard from the Daily Runner staff. We wish you merry finals and a happy winter break!